During Easter long weekend, the Four frogs will be open everyday, with a chocolate special crepe and surprises for the kids. Four Frogs Mosman is the perfect place to enjoy our delicious breakfast. Come and try our breakfast crêpes that are made to match our delicious coffee. 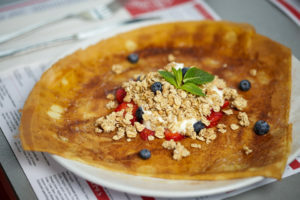 Our crêperies are open till late on Australia Day. Join us in celebrating this momentous day. Our new summer drinks menu bathed in refreshing, summery goodness.